Peppermint Essential Oil (Mentha Piperita) - Sweetgrass&Rain Inc.
Mentha Piperita, also known as ‘candy mint’, was once thought to be a species, but has been found to be a perennial hybrid that only proliferates by spreading its rhizomes underground. A very hardy fast-growing herb, it can grow almost anywhere. It has reddish veins and lightly fuzzy leaves, and its interesting chromosome count can vary between 66 and 120 chromosomes. Peppermint's name has its roots in Greek mythology. Hades, god of the dead, pursued the beautiful nymph, Minthe. Hades' wife, Persephone, became jealous and turned Minthe into a small and insignificant plant on which to be trampled. Pluto could not undo the transformation, but ensured that Minthe would always be loved for her fragrant aroma. 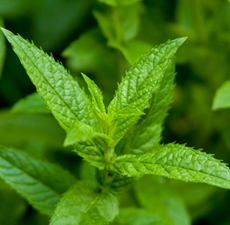 Peppermint Essential Oil has a sharp penetrating scent, based on its high menthol content. The minty sweetness makes it one of the most popular Essential Oils.